Blues (NPR Curious Listener's Guide). Examining the changing face of the genre from its beginnings at the end of the 19th century to its international popularity today, this book traces the social climate that inspired the blues and takes a look at the unmistakable influences that blues had on 20th-century music. Includes information on performances from Muddy Waters to Eric Clapton.National Public Radio has published "curious listener's" guides to a number of musical types, including classical, opera, folk, popular, and celtic. With its recent, "The NPR Curious Listener's Guide to Blues" (2005), NPR offers a sympathetic, thoughtful, and broad-based guide to a uniquely American and African American music. The author, David Evans, is Professor of Music at the University of Memphis where he has designed a program in ethnomusicology with a specific specialization in southern folk and popular music. He has written widely on the blues and received a Grammy in 2003 for his liner notes to a seven-CD collection, "Screamin' and Hollering the Blues, The Worlds of Charley Patton." Although the blues have received much popular attention in recent years, it is gratifying to see the increased amount of serious, scholarly study that the music is receiving. It is long overdue. Evans has written an introductory account of the blues that will, indeed, whet the appetite of the new listener, but he has done much more. He treats the music seriously, with an obvious love, and without stereotyping or hype. There is much to be learned from his book about the music, its history, its performers, and its place in American life. The "blues" are notoriously difficult to define or to categorize, but Evans stresses that "[a]bove all else, blues music is about conveying personal feeling and, in so doing, reaching others and establishing a sense of life-affirming solidarity." (p. 165) With all its learning, this book keeps the emotional, personal core of the music at its center. Evans also describes in succinct, non-technical language the formal characteristics of the blues, the use of blue notes and chordal patterns, and the various types of interplay in the blues between vocal and instrumental lines. 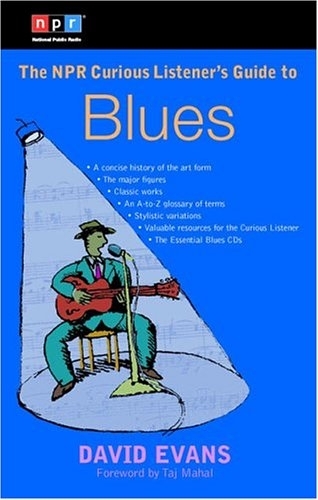 A chapter titled "the Language of the Blues" offers good basic guidance not only to the blues but to elementary music theory as well. The early chapters of the book offer discussions of the origins of the blues near the beginning of the 20th century, and of its pioneer recordings. He discusses the varieties of the blues that have developed in its now century-long history, including the classic or vaudeville blues, country, folk blues, swing, and jump, electric blues, Chicago blues and much else through the appropriation of much of the blues sound by British and American rock and roll performers. Evans also offers three related chapters giving biographies of many famous blues artists, detailed discussions of fifty blues songs, chosen for their excellence and representative character, and fifty blues CDs. These songs and CDs are well-chosen and non-dogmatically presented. They will give the new listener a cross-section of the types of music and artists that have formed the blues. The lists will form the basis for endless listening and enjoyment and will encourage the new listener to explore the blues further. 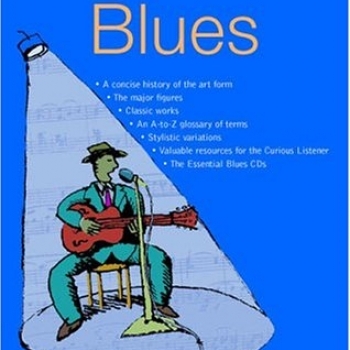 Evans's concluding chapter includes a guide to books, magazines and websites devoted to the blues. This book will appeal both to newcomers to the blues and to those who know and love the music. Most importantly, Evans shows the reader that the blues are not merely a product of "pop" culture, but rather are a serious, influential and passionate American music that will amply repay attention and study.